Jolanta graduated with a Bachelor of Arts, Honors Specialization in Sociology from the University of Western Ontario in 2013. In 2015, Jolanta obtained her Paralegal Diploma from Seneca College. During her time at Seneca, Jolanta played an integral role in the Legal Studies Student Association and became president of the association in her final semester. In 2016, Jolanta became licensed to provide legal services with the Law Society of Ontario. 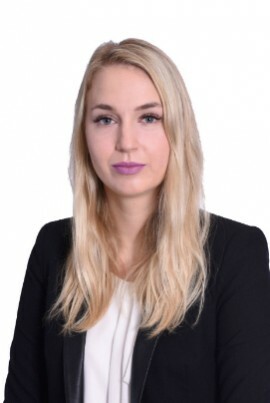 Prior to practicing as a Paralegal at Mason Caplan Roti LLP, Jolanta worked for law firms specializing in Insurance Defense, followed by significant experience in a Plaintiff Personal Injury firm, where she handled a high volume of Accident Benefits claims. As a Paralegal, Jolanta has carriage of Small Claims Court actions exclusively in subrogation. Her main areas of focus include property damage, product liability, water damage and motor vehicle accident claims. Additionally, Jolanta assists senior lawyers with the preparation of Affidavits, Pleadings and Motions.